Everything ProvenExpert.com can do for your business, plus much more. Custom-tailored solutions for companies and corporations. Your service team and representatives are brand ambassadors for your company. They play a major role in enhancing customer satisfaction and are key to your success. Import reviews and ratings of your staff, branches, or entire company from other platforms into your ProvenExpert profile. Customize your surveys, layout, and workflows to fit the needs of your business or automate the review process with our application programming interface (API). Measure and compare the satisfaction of your customers with individual staff members, teams, branches, or your entire company, and recognize trends in your business with impeccable timing. With customized surveys you can see exactly what your business' strengths and weaknesses are. ProvenExpert's automatic survey analysis shows you how satisfied your customers are and how often they recommend your products or services to others. You can even monitor customer reviews and ratings (quantity and overall score) from other platforms and websites for around-the-clock customer satisfaction trend analysis. Click a logo to see more details. With Sixt Car Sales, no matter buying or financing a nearly new car is a great experience. Five locations offer a wide range of vehicles in Germany. The POS-Solution, designed by ProvenExpert, helps us to identify how our customers feel, this method is effective and eligible. Thus, we can constantly optimize our structure and work more successfully. The expert SE, located in Langhagen, is a trade association group for consumer electronics, information technology, telecommunication, entertainment and electrical appliances. Currently, there are 194 expert shareholders and members combined in 432 locations across the federal territory. True to the motto “With the best recommendations”, does expert SE stand for the highest service and consulting expertise. ProvenExpert has convinced us because all reviews are finally in one place for our customers to find! Since its foundation in 1971, the CENTURY 21 real estate brokerage network has become one of the world's leading residential real estate agencies. Gothaer has over 4,2 Mio. members and is one of the biggest insurance companies in Germany. They offer risk and finance concepts as well as indivdual solutions for their customers. The service of ProvenExpert is transparent and easy to use and the reputation of the companies has risen enormously. BNI, the Business Network International, has a weekly meeting with a clear goal: Growing turnover through new contacts and business recommendations. 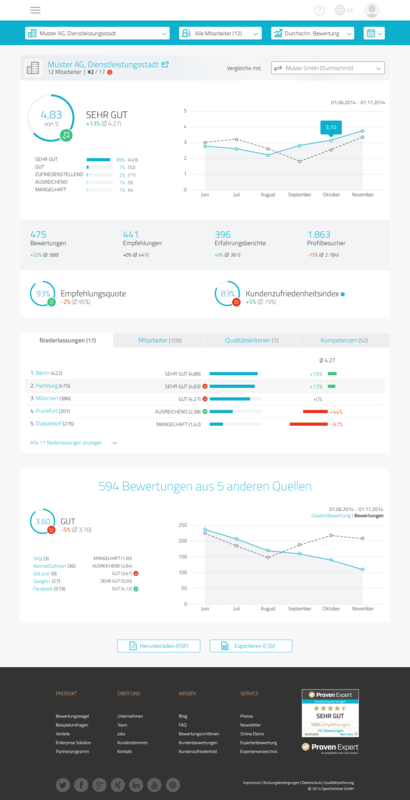 ProvenExpert is a great help to gather customers´ feedback in a quick and easy manner. This feedback helps us to develop further and to meet our client´s expectations. For more than 30 years Rundstedt und Partner support people to master career changes and company´s to shape seperation processes responsibly. The AVAG Holding is one of the leading automobile trading groups in Germany. The headquater in Augsburg is hosting 53 companies and is situated in 156 locations. We can clearly see that customers who have given an online-review on ProvenExpert are more likely to recommend us offline. HYPOFACT AG is an independent distributor for mortgages and real estate loans. Qualified residential mortgage consulting is provided in 60 regional offices. At Küche & Co, customers are provided with individually tailored kitchens "made in Germany" nationwide in first-class quality, timeless design and high-quality equipment. The satisfaction of our customers is very important to us. With ProvenExpert we can easily show the experience of buildings owners (who built with us) to new and potential customers. We stand for customized system architecture, technical innovations, and a convincing price-performance ratio all around building at the highest level. We rely on ProvenExpert. An easy to use and customizable tool for presenting quality and trustworthiness by using customer reviews. Speakers Excellence, a speaker network, promotes the professional exchange of innovative knowledge, presented by top-speakers in the areas of Economics, Politics, Education and Sports. By using ProvenExpert, we can promote the quality of our services to potential clients in a transparent way and establish their trust in our service. Real-time information receiving new ratings and reviews, seal integration on our website, and Google star rating - ProvenExpert has become an indispensable tool for us. Motor Center Heinen GmbH has been one of the largest dealership groups in the Ruhr area for more than 50 years and offers a complete service for new and used vehicles of all kinds. Inviniti AG is a consulting company and stands for transparent product comparison and qualified consultation on the financial market. They teach their customers that financial planning can also be fun. Refreshingly Bavarian. Since 1281. Kondrauer mineral water comes in four flavors: Sparkling, Medium, Gentle und Natural. The assortment also includes spritzers and sodas. For us with our franchisees, it is important that customer feedback can be given easily and without registration and that already existing reviews are also displayed. The core competence of the leading brokerage network ERA is the professional and efficient placement of residential properties to guarantee a safe and carefree sale. Engel & Völkers is a national service company that provides high-quality real estates. Among other things they offer yachts, planes and represent their company in 700 locations. With ProvenExpert, we collect high quality and reputable reviews. The rating seals (i.a. TOP RECOMMENDATION 2017) create confidence in our performance. Our core competencies are the professional, final processing of incoming telephone calls, chat inquiries, and the conduction of customer surveys on customer request. By now the Flugel Group has 20 years experience within the motor and vehicle business. They are one of the biggest authorised dealers for Honda, in Germany. They offer six locations in Saxony and over 1.200 new and used cars. The Postbank offers online-services for construction financing as well as security through personal consultation. Numerous construction and finance experts can consult customers throughout Germany. I recommend any franchise system to use ProvenExpert´s Enterprise Solution. Both, franchisor and franchisee, will benefit from numerous customer reviews. The Franchise Business Club is the largest interactive franchise community in the German-speaking countries. This is where everyone who feels connected to the franchise and / or license business meets. Since using ProvenExpert, we know even more about our cutomers - what they are looking for, what they like about us, and where we can improve further. Operating aqua park, leisure, thermae, spa, and hotel facilities for more than 30 years, GMF offers their guests and customers excellent service and highest quality. Auto-Blank is a service partner for commercial vehicles from Audi, Volkswagen and VW. They place their focus on their customers, which will be supported from service to accident care. The merge of Premiummakler was motivated by the interest of their customers. They are experts concerning questions about finance and insurance. Barmenia belongs to one of the biggest and independent insurance groups in Germany. They offer health care and life insurance as well as accident, car, property and liability insurance. Our distributors benefit from ProvenExpert's state-of-the-art and user-friendly review system as an ideal complement regarding communication with existing and new customers. With 280 distributors nationwide Inspiration Küche offers the latest trends of manufacturers, technology highlights, and much more from the world of kitchens. SPEEDtraining is a time-saving and effective complete-body-training. With personal customer support it is possible to experience an individual training concept. Reviews are the best way to gain new customers trust. With ProvenExpert we collect these reviews and display the results effectively on our website and at our locations. DB Autohaus offers at its five locations a large selection of used, premium and commercial cars. Attached repair shops guarantee a professional mutli-brand service. The customer reviews set our insurance consultants apart from the competition. Their visibility on the internet has improved significantly. Our focus in on the customer - that has been our mission for more than 190 years. Regarding all aspects of private provision, asset generation, and protection. As a professional association, it is important to us that the end user see that our members offer better prices and perfect consultations. The Verband Deutscher Büchsenmacher und Waffenfachhändler e.V. (VDB) is the interface association between manufacturers, wholesalers and end consumers. Fitness Noellen is a fitness center in Widnau. They offer a broad range of courses, good price performances and professional customer services. ProvenExpert's diversity convinced us to the fullest. The reviews helped us to extend our reach significantly, also nationwide. With a total of nine branches in Saxony-Anhalt and Brandenburg an der Havel, the Thormann Group is one of the largest Skoda and Mitsubishi authorized dealers in Germany. Customer feedback is important to us! Learning about our customers' needs and requirements enables us to improve our services constantly. Schwenninger Krankenkasse is a German health insurance company with about 330,000 customers and is ranked in the top 20 statutory health insurance companies. The head quarter is in Villingen-Schwenningen, Baden Wuerttemberg, and there are 15 corporate offices in Germany. Due to ProvenExpert and our client´s reviews McData partner appear on page one of Google with our keyword. We also love the aggregation of reviews from 3rd party platforms. McData offers customized services for financial and payroll accounting, as well as business accounting for small and medium-sized enterprises. The Mühlenberg Group is an authorised dealer for Volkswagen, Audi and Skoda. They hold eight different locations in Ludwigshafen and surrounding areas. Reviews collected with ProvenExpert create transparency and built trust - perfect advertising. The Müller Group, founded 60 years ago, is today one of the largest car dealership groups in Germany. In Saarland and Rheinland-Palatinate we have 6 car brands with 16 car dealers in 10 locations. Whether operational change, balance of interest or social planning, Dr. Hoffman and his experienced team offer first-aid as well as solutions for topics concerning work and social right. ProvenExpert generates transparency and therefor security for our clients and better insight into our business. Aggregating reviews from other 3rd party platforms is easy to use and representative. The lawyers at FENDERL are specialized in road traffic, criminal, insurance, and labor nationwide. Purpose: to lift sanctions and to enforce requirements against other parties. We can map all locations, seminars, trainings, and events on one profile. Topic-specific ratings enable us to measure quality across locations. Beitraining is a specialist in corporate development of SMEs offering concepts, consulting, training, and coaching. Von Borries & Partner offers premium catering and exceptional locations in Köln-Bonn and surrounding areas. Their identifying feature: timeless elegance, versatility and quality. 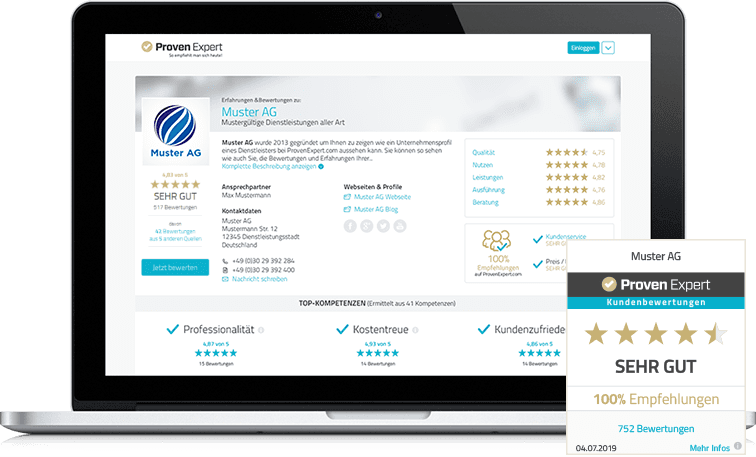 With ProvenExpert we can measure our customer´s satisfaction and win new customers using the positive reviews. Gästeliste030 is Berlin's biggest nightlife online guide and offers reliable and up-to-date information, regarding parties, events, and open airs for Berlin and surrounding area. Herold is Austria’s largest provider, concerning websites and the leading specialist in online-marketing, media and service. Over 20.000 websites and 600.000 customers speak for themselves. Honorarfinanz AG is an institute for independent fee counseling who provides help with efficient money investments in the form of retirement arrangements and financial planning. AIGNER Immobilien GmbH is one of the bestselling brokerage firms in Munich and surrounding areas. The multi-awarded enterprise records a property value of 300. Mio Euro a year. Cargoon is the specialist concerning electronical problems on vehicles of any kind. Years of experience in the automotive industry, allowed Cargoon to become the pioneer in Hamburg and surrounding areas. Genesys International GmbH is a gastronomic training academy and provides counseling for hotels and restaurants. New concepts and ideas enable a profit maximization and assist customers during daily problems. Küchenquelle is one of the most successful providers for kitchen, in Germany. They offer a service network with advisers and optional planning in one of their 13 studios or at home. Locatec Ortungstechnik GmbH is the leading provider for professional first-level damage in Germany and Austria. They support customers in case of water damage and leak detection, at 63 locations. Allianz Polska is at the top of Poland’s insurance institutions. In the range of insurance and finance industry they serve and support 1,4 Mio. private and corporate clients. 25MINUTES offers personal EMS- and EMS-Cardio training in combination with a sustainable nutrition concept, for sustainable success. They offer four different rate variations to choose from. All your customer reviews are funneled into a single company account and a visible rating seal which makes it easy to generate customer trust, improve your online reputation, and boost revenue. Do you still have questions? Are you interested in a personalized offer? How about scheduling a platform demonstration or a call with one of our sales consultants? Simply fill out the information form, and we'll handle your request right away. Interested in more features or specific services? Get in touch with us to let us know how we can help. Send us an email at info@provenexpert.com or give us a call +49 (0)30 270 041 905 (Monday through Friday, from 9am to 6pm, CEST). Our marketing managers are available to help with any questions, ideas, or requests.